KANSAS CITY, Mo. - It happens to everyone – you are ready to leave the house for dinner or to get the kids and you can’t find your keys. It may sound cliché, but there’s an app for that. Many apps work in conjunction with GPS technology to help you track the things that mean the most to you, such as your children. “You are just trying to watch them every second, and I have twins so they like to go in different directions,” Peggy Ford said. Ford and other parents’ greatest fear is not knowing where their child is. “My daughter thought it would be fun to play hide and seek in Target and I went absolutely bonkers. The panic you feel is all-consuming,” Ford said. Nowadays pretty much everything we do and use can be tracked, things like your phone, keys and even your car. That made Brian Sullivan, CEO of Precise Innovation, wonder, why not track where your child goes? “Technology today is too cheap, it is too economical to not put on a kid,” Sullivan said. His Kansas City-based company created the Kidsport Burst GPS Phone Watch , which parents can use to track their kids using their smartphone. To kids, it’s just a watch and step counter. One of the $140 watch’s most notable features is the panic button a child can push to alert their stored emergency contacts that they may be in trouble or need help. “We are tracking our wallets. We are tracking our dogs. What is our greatest asset? It is our children,” Sullivan said. Free apps, such as Life 360 and Family Tracker – Phone Tracker , are also available for those who don’t want to drop the money for a physical device but still want to keep an eye on their kids. There are even devices to help keep our furry friends safe and close to us. “He is very loyal, except when he gets out,” Sarah Johnson said. Johnson said her dog is family – but he is also the only member who likes to leave home without asking for permission. “Last summer he got out and was gone for about eight to nine hours. We found him at an auto part shop a mile away from home,” said Johnson. Garmin makes GPS trackers for dogs. Garmin spokesman Ted Gartner said their devices are best used for very active pets, such as hunting dogs. “It became a very popular device for us over the last decade. 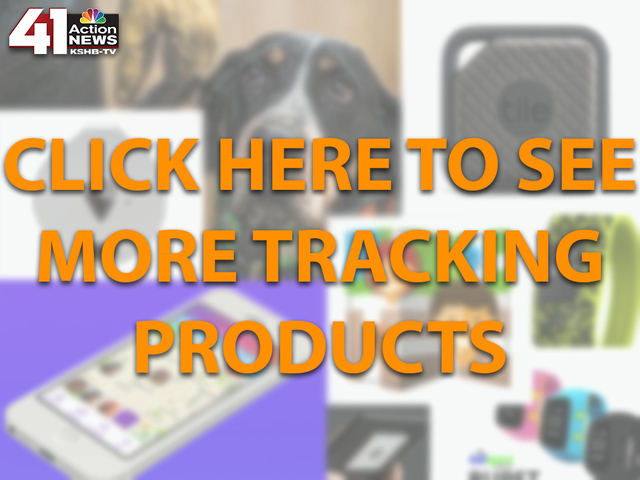 We are kind of known as the pioneer for GPS tracking for dogs,” Gartner said. The Astro 320 tracker can show you where your pet is within a range of nearly 9 miles. The tracker and collar attachment run at about $600, but Garmin does make other trackers that are less expensive. “You let your dog go and you look at your receiver and it will tell you how far away your dog is, the distance and direction, and what your dog is doing,” Gartner said. If you’re looking to track more material items such as car keys, remotes, or tablets, Tile might be for you. Tile is a small square tracking device that you can attach to many different things. TrackR products are similar and feature a “wallet” design to fit in credit card slots. Tile has a range of 200 feet, and also uses a network of other Tile users to help locate items. You will get a confidential notification sent to your phone if another Tile user is near your lost or stolen item, and then you can track it down.